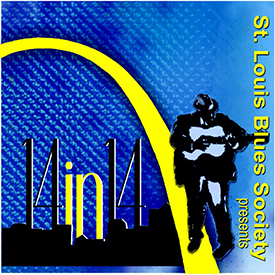 The St. Louis Blues Society is proud to present 14 in ‘14 – a collection of 14 original songs by St. Louis musicians performing in 2014. This is a sample of contemporary St. Louis musicians who represent a wide range of blues in both style and performance and can be seen performing nightly around the city. While this CD is not comprehensive—it would be impossible to include every St. Louis act on one CD—it is a good sampling of what is happening on the St. Louis scene. We hope that if one of the artist on the CD piques your interest, you choose to go see them live, purchase one of their full-length CDs and spread the word about the outstanding talent in St. Louis. Knocking Boots – Eugene Johnson & Co.